The west coast reefs around Tumbatu island, Hunga, Kichafi, and Hadji have excellent fish life, Mwana is a turtle hotspot with multiple sightings on many dives, and Shamzi is home to a number of rarer finds including weedy and Mauritius (aka paddle-flap) scorpionfish and seahorses. There are good photographic opportunites for wide angle and a plethora of macro subjects. Mmemba Atoll round to the east coast has some drop offs and walls, and Leven Bank out to the north can provide an exhilharating fast drift dive. All of the sites offer a wide range of beautiful soft and hard corals. The marine life seen on many of our dives include angelfish, butterfly fish, moorish idols, lionfish, surgeon fish, trigger fish, clown fish, damsel fish, cuttle fish, cray fish, puffer fish, box fish, parrot fish, nudibranches, shrimps, crabs, wrasses, snappers, eels, sting rays, dolphins, barracudas, sweet lips, groupers and turtles, plus many many more! Made up of a series of interconnected bommies consisting of hard and soft corals at 18m, Hunga Reef is one of the is one of the best dive sites in Zanzibar. Whereas many of the reefs are fringing reefs around the islands, Hunga is a patch reef four nautical miles out to open sea. Often seen are big shoals of barracuda, tuna and snappers. You can also expect to see parrotfish, unicorn fish, schools of fusiliers and brightly coloured coral grouper. For the really lucky diver, sharks, eagle rays and even manta rays have been seen - but these sightings are very rare. Nearby and at a depth of 16m Nankivell Reef consists of giant plate corals in fascinating formations. This reef is home to rays, napoleon wrasse, giant remoras and groupers. Shamzi Reef is one of our magical places full of weird, wonderful and highly venemous creatures! The reef here is not as big and beautiful as many of the others - however, it is full of absolutely amazing marine creatures. On Shamzi we can find the weedy scorpionfish (Rhinopias Frondosa), the closely related Mauritus scorpionfish, more than six species of lionfish, bearded scorpionfish, plenty leaffish, and even the bizarre Indian Ocean walkman! 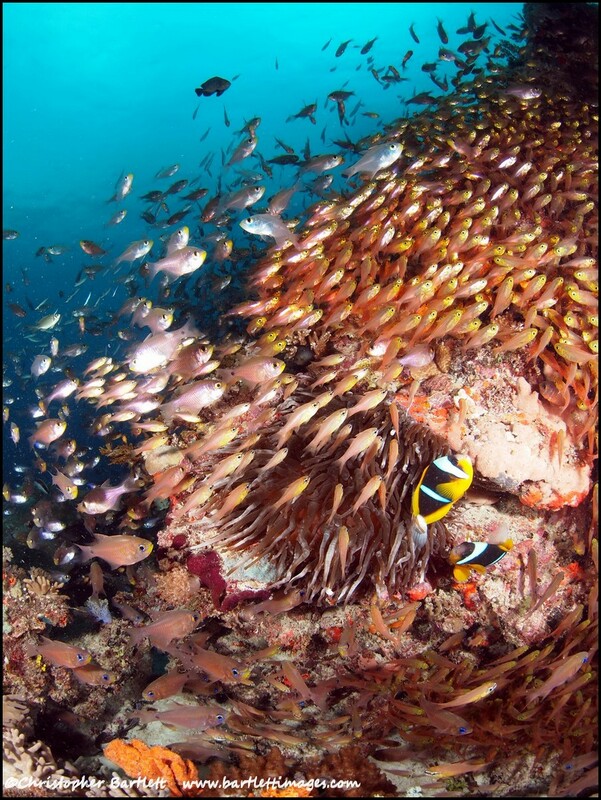 Every scorpionfish in Helmut Debelius' Indian Ocean Reef Guide has been spotted on this one reef! Shamzi is also the most likely place to find our beautiful thorny seahorses (Hippocampus histrix) as well as ghost pipefish, frogfish, ribbon eels and loads of nudibranches, stingrays and octopus! This one is not to be missed! 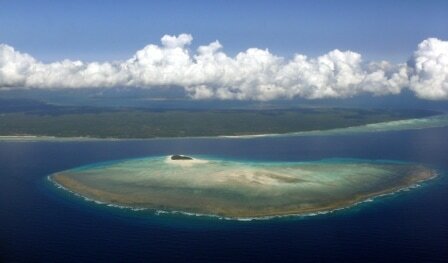 The depth on Shamzi ranges from 10m - 25m and is a perfect reef for a multilevel dive. The majority of the corals can be found between 12-15m. The time of the dive must be carefully planned to minimise currents and have the best visibility! Tumbatu Island is surrounded by a coral shelf, which supports a diverse selection of colourful corals and small reef fish. Some of our more camoflauged species found on this reef include frogfish, ghost pipefish and seahorses. We have had a few sightings of 2m+ giant groupers which we always get excited about. Gentle currents and calm waters offer a relaxing dive either along a shallow coral wall 8 - 12m deep at Three Turtles or a gradual bank at Ras Mskitini. On the tip of Tumbatu is a lovely dive site known as Mwana wa Mwana with a gradual sloping reef from 5 to 12 metres. Several of our guests have commented that this dive has the best variety of corals seen in the world and we believe this looks identical to the reef in "Finding Nemo"! The soft corals in particular are really diverse and colourful. Tumbatu is Zanzibar's best kept scuba secret! We have recently discovered a reef nearby known to the fisherman as Pengeleni and we have had some amazing sightings from spotted eagle rays swimming past to seahorses, frogfish and a octopus eating a blue spotted stingray! Mnemba Island is a favourite with many divers and visibility here is often in excess of 20m. You will find a variety of dive sites with depths between 10 and 30m, suitable for both beginners and advanced divers. Visit Kichwani Wall, a steep coral bank with a number of small crevices hiding lion fish and porcupine fish, if you look up to the top of the wall you may be lucky and see the occasional pod of dolphins swimming by, or look out into the blue to see schools of travelly (jacks) or the occasional Napoleon wrasse. Further round the island, Watta Bommy and the Aquarium are the favourite locations for searching for turtles. 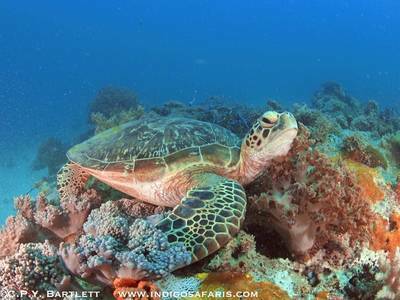 Both Hawksbill and green turtles may be spotted blending in nicely with the plate corals. Every now and again we get to see white tip reef sharks visiting the reefs around Mnemba Island! On the east side of Mnemba Island, The Big Wall is an advanced deep dive with a depth ranging from 30 to 40+ metres. This site does not offer many corals, but some divers like deep dives with strong currents in hopes of seeing larger pelaegics and possibly sharks. Napolean wrass, snappers and tuna are often seen. Leven Bank is an undersea mountain approximately 6km long. The surrounding deep water and strong currents bring schools of large pelagic fish to the area. Either drift with the current along the top of the bank at 18 -25m or drop on the side of the bank at 30+m and multilevel your way to the top. Expect to see moray eels and octopus and be surrounded by schools of tuna or trevelly. An exhilarating dive recommended ONLY for experienced, advanced divers. 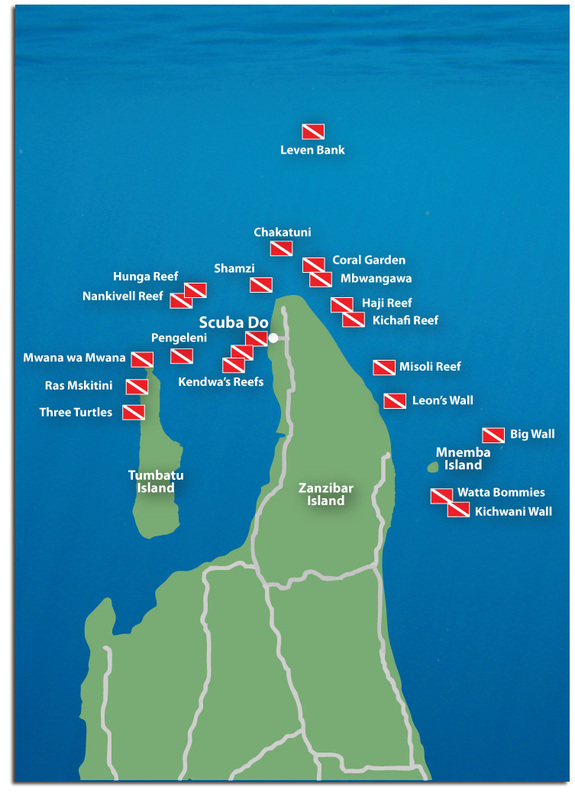 The local reef known as Kendwa Reef offers several dive sites which are ideal for beginners or qualified divers interested in a long shallow dive. The coral reef runs parallel to shore and has a maximum depth of 8-10m you will see many small reef fish and beautiful anenomes hiding in the coral garden. You can often see some juvenile fish which are not common on the deeper reefs and we have had numerous sightings of sea turtles. Kendwa Gardens is a specific drop on this reef offering a shallow dive with many nudibranches, spanish dancers, pipefish and occasionally marbled electric rays. Renco Bomi is located a short distance in front of the jetty at our dive base located within La Gemma Dell'Est. It consists of a coral reef 5 - 18m deep. Rare staghorn coral grows in this area and frequent visitors include squid, cuttlefish and a variety of rays. Keep your eyes open for frogfish, seahorses and ornate and seagrass ghost pipefish! This spot is a favourite for night dives. Around the northern tip of Zanzibar Island, a stunning wall of lattice or maze plate corals fringe the island. With depths ranging from 10 to 20 metres, we dive Kichafi and Haji reefs and often both reefs within the same dive. Kichafi has a school of spadefish on top of these beautiful plate corals as well as leaffish, lionfish and stunning sweetlips. Dolphins are often heard and sometimes seen swimming past the dive site. Mbwangawa is another one of our favourites with a variety of corals in combination with a variety of fish life. On numerous occasions we have found guitar shark rays just off the reef on the sand. Adjoining to Mbwangawa, Coral Gardens is a lovely place where the green turtles like to hang out and it is also full of nudibranchs and beautiful colours. Chakatuni reef is on the northern tip of Zanzibar Island which borders on deeper waters and is best to dive on the high slack tide to minimise the currents. Chakatuni is a fringing reef with very nice hard and soft corals and huge barrel sponges on the perimeters - however, currents can be tricky! For the adventurous divers, we are always keen to go exploring new areas with the assistance of sonar combined with the knowledge of local skippers. We have done a few dives on remove reefs in Tumbatu West which are very interesting. We have also explored what we named Mussa's Reef which was a fantastic shallow wall next to Popo island. When sea conditions are accommodating, we are always keen to go exploring reefs enroute to Pangani or even Pemba!